A premier four season, destination resort in upstate New York. Proudly owned and operated by the Oneida Indian Nation. Whether you like to spin the wheel, deal the deck or roll the dice, Turning Stone Resort Casino brings excitement to the table with a broad range of your favorite games. Choose from Blackjack, Craps, Caribbean Stud Poker, Let it Ride, Roulette, Mississippi Stud, Pai Gow Poker, Three Card Poker, Four Card Poker, Baccarat, Sic Bo, Texas Hold 'Em Bonus, Mini Bac, Midi Bac (Macau style), The Big Six Money Wheels and Casino War. 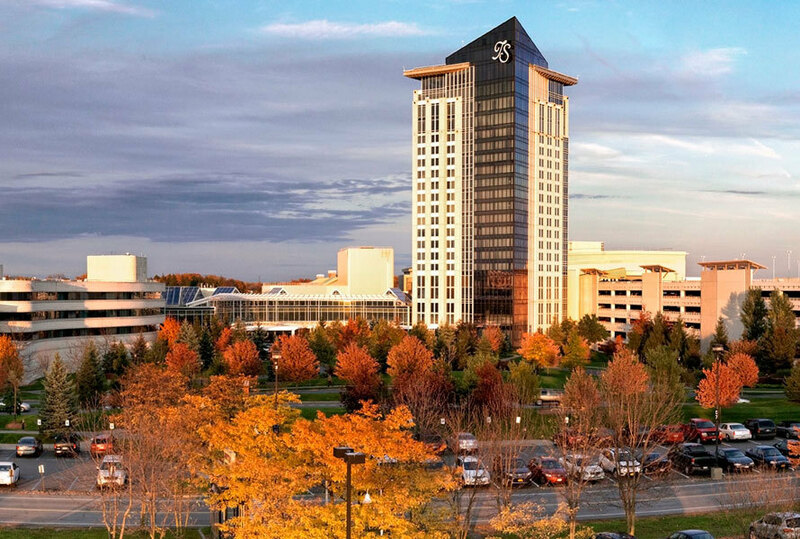 Turning Stone Resort Casino offers 72 holes of golf, with a trio of 18-hole championship courses that have earned the resort recognition as one of the northeast's premier golf destinations. Three preeminent golf course architects -- Tom Fazio, Robert Trent Jones Jr. and Rick Smith -- have each crafted masterpieces at Turning Stone. In addition, Turning Stone offers its own golf academy with a team of PGA-certified instructors, and a year-round indoor training center. Consider one of our popular golf packages below, or call us to create a package specifically designed to your time and interests -- select the dates, lodging and dining to fit your personal style and we'll create your custom package. Flavors of Asia - Take a break from the ordinary and EXPLORE THE EXOTIC TASTES OF ASIAN CUISINE at Turning Stone. While you may already be familiar with our Chicken Parmesan, Shaved Beef On Weck and White Pizza from Pino Bianco, Upstate Tavern and the Food Court, you might not be aware that we also have a comprehensive selection of Pan Asian inspired menus representing culinary delights from across the Pacific Rim. From award-winning dining to a quick bowl of noodles that will warm you on a cold winter day, we have all your Asian favorites. And perhaps some new culinary adventures you wouldn't expect so close to home such as Panang Kai, Paht Thai, Bun Bo Hue Beef and Pork Soup, Steamed Bao, General Tso's Chicken and Spicy Tuna Roll. Peach Blossom - Peach Blossom incorporates primarily Chinese and Thai Cuisine. Both are well known for their variety, fresh ingredients, unique blend of flavors and their sweet to spicy flavors. We have created a menu blending authentic Chinese Cuisine and worldly American flare. Our chefs create innovative, artistic and succulent dishes that not only satisfy your palate but delight your eyes. Noodle Noodle - This unique, casual restaurant offers a flavorful variety of Chinese, Vietnamese and Thai noodle soups. Hong Kong Kitchen - Hong Kong Kitchen serves a variety of authentic Asian favorites in a market-style atmosphere. Hong Kong Kitchen will feature a wide menu of popular Asian entrees including beef and broccoli, shrimp in garlic sauce, sweet and sour pork, plus tempting sides. Atrium Bar - Atrium Bar, located in the Exit 33 complex, is the place to go for a sleek, ultra-lounge atmosphere, full bar and popular sushi menu. Don't miss our half price sushi specials and $4 drafts Wednesday and Friday from 5:00pm - 9:00pm. This is the perfect spot to stop for a cold draft and favorites like Philadelphia Roll and Green Monster Roll. TS Steakhouse -Located atop the Tower, TS Steakhouse features a menu to dine for plus panoramic views, lifted spirits in our penthouse bar, and fine cigars in our intimate smoking parlor. Inspired by the cultural dining history of the Oneida Indians and their practice of "eating the seasons" through locally sourced and sustainable foods, TS Steakhouse builds on this long-standing tradition to deliver fine dining steakhouse favorites created with seasonal ingredients. TS Steakhouse has received Open Table's 100 Most Romantic Restaurants in America Award for three consecutive years (2015, 2016, 2017). Most recently it was recommended by Forbes Travel Guide as One of the Finest Properties in the World for 2016 and also received Wine Spectator Magazine's 2016 Award of Excellence. Wildflowers Restaurant - Each perfectly orchestrated meal in the intimate, 65 seat elegant Wildflowers Restaurant at The Lodge sets the stage for a most memorable dining adventure. Behold a delightful display of culinary magic as traditional continental cuisine is prepared to your exact preference. Pino -American classics to new favorites, Pino Bianco offers a casual yet sophisticated dining setting, and Bar Pino is the place to sip on a perfect glass of wine. Find all in the midst of the premier Turning Stone Resort Casino. Upstate Tavern - From local ingredients to local brews, the Upstate menu offers dishes to suit the heartiest appetites and includes crave-worthy Binghamton Spiedie Rods with tzatziki; a finger-licking good Wing Bar with a choice of sauces; Sliders featuring sharp cheddar cheese from Cuba, NY; and the true Upstate classic Poutine, composed of hand-cut russet fries topped with pot roast gravy and Yancey's cheddar cheese curds. Delicious burger choices are plenty and favorite comfort foods like Utica Shrimp Riggies, Clint's Summer Camp Fish Fry and BBQ Glazed Beef Meatloaf will make you feel at home. The culinary inspirations are time-honored, New York-inspired, and familiar American classics prepared with the freshest ingredients made from scratch and locally sourced when available. Not to be missed is Upstate's wide selection of rotating craft beers from the Empire State's finest breweries including Saranac, Ithaca Beer Co., and Ommegang, plus our refreshingly cold house brew, Upstate Lager, always available on tap and always a crowd pleaser. Tin Rooster - Saddle Up! At Tin Rooster, the pig's sacred, the beer's cold, and the atmosphere is Country Americana at its finest. Our BBQ features signature flavors that may start a finger lickin' addiction. But we've got more than food - If this barn is a rockin', come on in. With iced cold beers, country girls dancing, and the best in country music, Tin Rooster is sure to get wild. Food Hall - Turning Stone's new Food Hall brings together the cuisine and culture of New York. Offering a wide variety of quick-serve dining options to satisfy every craving, from juicy burgers, fresh Mexican food, authentic Asian favorites, classic deli sandwiches, wickedly good pizza and of course some chicken dinners! For food lovers or those who want to try it all, this fast casual style dining experience is sure to offer something for everyone. Emerald -From dawn to dusk, the full-service Emerald restaurant serves casual fare in a comfortable, relaxed setting. Choose from a classic American menu ranging from hearty breakfast favorites, to fresh salads, sandwiches, burgers and full dinners. Open 24 hours a day, the Emerald is a great place to find early morning refreshment or a satisfying late night snack.